A full coach left Durham in brilliant sunshine, and after passing quickly through the western bypass, we were engulfed in a shower crossing the Tyne. Coffee and a freshly-baked giant scone awaited the party at Otterburn Mill. On the short journey to Abbotsford we passed through the high moors cloaked in glorious purple heather. Arriving at Abbotsford we were welcomed by an authentic Scottish mixture of grey skies and persistent rain. 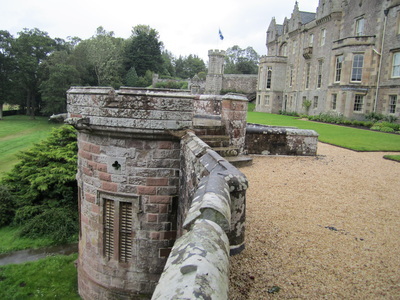 After a brief break to stretch our legs, a lunch of soup and sandwiches was offered in the new restaurant overlooking Sir Walter Scott’s fine baronial home. Our tour of the house began in the hall, the walls of which were covered with an extensive collection of armour and other warlike artefacts. Perhaps this indicated a longing on Scott’s part for a career in the military, which was unable to be fulfilled as a result of a bout of polio in his early years. 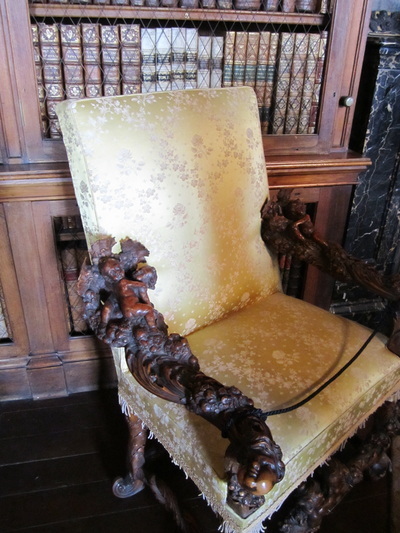 The comfortable study contained Scott’s writing desk, wood from wrecked Armada ships, and some 2000 books. 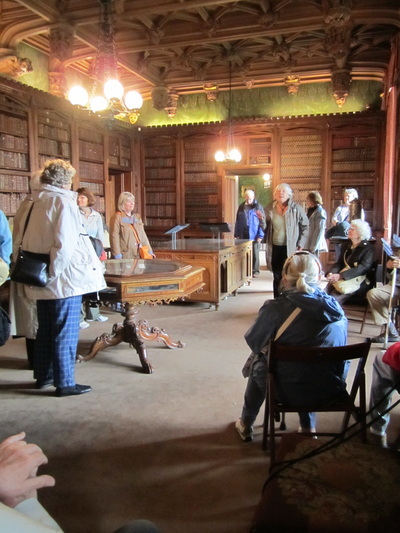 We continued into the library, flooded in natural light, with its wooden ceiling carved to appear as plaster, and modelled on Rosslyn Chapel; elaborate Italian chairs, and 7000 original books which were arranged by Scott himself. The library and the drawing room both enjoyed extensive views of the rear garden down to the River Tweed. The walls of the drawing room were covered by flamboyant Chinese wallpaper (denoting happiness, wellbeing and wealth). Scott was an eccentric collector as evidenced by a picture of Nell Gwynn, together with many oddities owned by celebrities of the day such as Nelson and Bonaparte. Innovations including oil/gas lighting and bell pushes operated by compressed air must have impressed Scott’s visitors to Abbotsford. 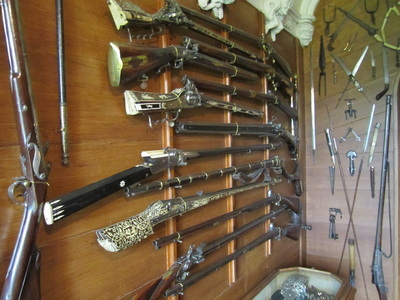 The armoury was followed by a lovely dining room, which was graced by Her Majesty Queen Elizabeth in July 2013, on the occasion of the opening of the extensions to the visitor facilities. Scott himself died in this room in 1832, following a series of strokes. Although the inclement weather precluded a full exploration of the gardens and grounds, the game/ice house was of interest, in that ice had been imported from Norway through Berwick-upon-Tweed as recently as 1939. 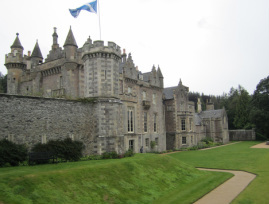 The party left Abbotsford after a tour which added clarity to an understanding of Scott and his life; and all expressed their thanks to John Woods for organising this enjoyable and instructive outing.